Power Struggles Part I: Are You at War with a Defiant Child? Power is one of the strategies people use to get their needs and wants met. As children grow, you will see them trying to gain power in order to get more autonomy and control over their lives. When your child was an infant, you had almost all the power. He communicated that he was hungry or uncomfortable by crying; that was the only power he had. As your child grew older, he took on more responsibility—and with more responsibility came more power. He learned to pick up after himself, and he also learned that refusing to do chores gave him some power. He learned to do his homework—and refusing to do it also gave him power. Remember, there is no such thing as positive or negative power: it’s simply power with positive or negative ends. There are many things in life that are empowering. Certainly information, knowledge and communication skills are empowering in a constructive way. And also sadly, violence, abuse, and threats can be empowering in a destructive way. If kids learn the latter lesson at any point in their development, they can become entrenched in a way of behaving where they use acting out, threats and verbal abuse to get what they want. I personally believe this is a dangerous path for kids to start heading down, and encourage parents to take this behavior very seriously when it first develops. And that’s their actual perception—most of the time they’re really seeing it that way. Most children and teens don’t perceive life the same way their adult parents do. As adults, we often mistakenly think kids see the same picture we do, so we might wonder “What’s the problem?” when they start arguing with us. But most kids don’t have the adult ability to perceive the totality of what’s going on. And not only are they developmentally immature, but there are certain obstacles that can block them from developing that awareness in an age-appropriate manner. There may be diagnosed (or undiagnosed) learning disabilities, which cause distortions in their thinking. The end result is that they become willing to fight everyone and everything in order to get their way. Teenagers especially see the world very differently than parents. While parents are concerned about safety and want their kids to avoid doing high risk things, teens may feel as if they’re being held back from doing things that appear reasonable and legitimate to them. This becomes even more complex when kids discover that some of their peers are allowed to do the things they are not. So teens can develop a way of looking at some of their parents’ decisions as unfair. That perception fuels their willingness to fight, argue, and engage in defiant power struggles with you. For example, you decide you don’t want your teen to go to a party if there’s no adult supervision. Your teenager just wants to go to the same party her friends are attending—she doesn’t have any thoughts at all about adult supervision or risk. When you bring it up, she thinks you’re old fashioned or out of touch—and the conflict starts there. For the most part, this is healthy. It may be annoying (in fact, you’ll probably feel you’re saying the same things over and over) but kids need to find ways to challenge adult authority appropriately. And by appropriately I mean not cursing, verbally abusing or personally attacking you. By the way, if the challenge is appropriate, parents need to learn how to respond with an open mind. It surprises many parents when I say that we don’t want to take all power struggles away. Rather, we want to take the defiance out of the power struggle. This is because as kids go through their developmental stages, they need to challenge their parents appropriately in order to get more autonomy. And parents, in turn, need to teach their kids that with autonomy comes responsibility and accountability. Children are looking to be more independent and make more decisions, but they should not be allowed to argue in an abusive, hurtful or obnoxious way. Here’s the bottom line: kids have to learn how to have power struggles with their parents in a way that is not a personal attack. Look at it this way: when a police officer pulls you over, if you don’t agree that you’ve made a mistake in traffic, you might find yourself in a power struggle with him. If you get out of your car and start screaming, that won’t get you anywhere. Instead, you try the tactic of calmly and respectfully explain your position. Whether or not he still gives you a ticket, you’ve been able to present your viewpoint in a way that doesn’t get you into more trouble, and might in fact solve your problem. In the same way, ultimately we want kids to learn how to advocate for themselves by engaging in actions and conversations which increase their autonomy—without getting them into more trouble. So know that it’s normal for kids, and especially teens, to get into power struggles. That testing, pushing and challenging of your authority, no matter how difficult to deal with at times, is your child’s job. As he matures, his goal is to separate and individuate from you—to form his own opinions and feelings about things. Part of that process includes the desire for more power and control over his life; your goal is to make sure he tests those boundaries without being abusive or threatening. Often, parents don’t want to expand a child’s circle of control over his own life as fast as the child would like. At the same time, kids want more control. So parents are constantly pushing against that wall to hold it steady, while the child is pushing back from the other side. Certainly, by the time kids are 13, 14, 15 or 16, they’re questioning the rules you’ve set for them. They’re pounding on that wall with a sledgehammer, asking, “Why can’t I go to the concert? Why can’t I wear make-up? Why can’t I borrow the car tonight?” Their confrontation of your limits becomes stronger and stronger as they get older. So defiant power struggles can increase in frequency and intensity unless parents know how to manage them. Almost all kids become increasingly resistant to parental authority as they grow older. For many kids, that resistance is acted out in socially acceptable ways. But some kids really get entrenched in power struggles. They become defiant, not just resistant. Their most common answer is “No, I’m not going to do it.” When you tell them there will be consequences, they’ll tell you they don’t care. The truth is, you really can’t win with somebody who’s got nothing to lose—you’ll just end up losing more and more of your own power. 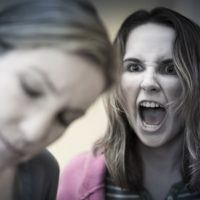 For parents in the situation where things have gotten to a point where the child is abusive and aggressive, I recommend that they seek some professional help. Because that pattern can be stopped and it can be changed. You don’t have to be stuck in that forever, you just need to learn how to deal with it. In my opinion, what these kids really need to learn is that defiance doesn’t solve their problem; defiance doesn’t get them what they want in the first place. And if parents don’t teach them this lesson when they’re young, these kids will certainly find out later when they’re dealing with the school system, their employer, the police or their spouse. Let me be clear: both the child who is mildly resistant to authority and the defiant, acting out child need to be empowered with problem solving skills to learn how to communicate effectively in the many situations life presents. I think that this particular training for adult life should start very early. Believe me, you can’t walk into your boss’s office and say, “This stinks, I’m not going to do it, you’re a jerk,” and expect to have your needs met. Kids need to learn how to negotiate and advocate for themselves in order to gain power, and they need to do it in an appropriate way—a way which doesn’t get them into trouble and doesn’t make the problem worse.